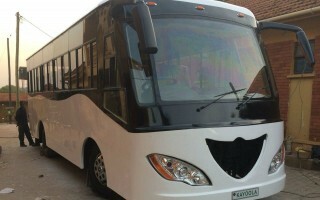 The Uganda-based Kiira Motors Cooperation has taken the lead in Africa’s automotive industry with the unveiling of the continent’s first solar-powered bus named “Kayoola” which means mass carrier. The 35-seater bus is uniquely designed to rely on 2 lithium-ion batteries which power an electric motor that is coupled to a 2-speed pneumatic shift transmission, a feature to make it environment friendly. One of its two batteries can be charged by solar panels on the roof which increases the vehicle’s 80km (50 mile) range. “Kayoola has a power capacity of 150KW (204HP) peak and solar power of 1320W which makes the bus a wonder,” remarked Mr. Isaa Musasizi, the CEO Kiira Motors Corporation. He reiterated the fact that the most important feature of the bus, the roofing material and stainless battery banks, were locally sourced and was assembled by a team of about 100 Ugandans who did the welding, spraying and wiring among other assemblage for the bus. Kirra Motors Cooperation hopes that the company will be able to manufacture all the parts and assemble the vehicle in Uganda, in a few years. The innovation of a solar-powered bus shows Uganda, a landlocked country, has taken advantage of its geographical location along the equator to improve its transport technology. However, the Kayoola is intended for urban areas rather than inter-city use because of the restrictions on how far it can travel. The Kayoola sets a good precedence and inspiration trend for the technological future of urban mobility for East and Central Africa and Ugandans must be proud to be championing a technology that represents clean energy with many positive reactions to the test drive. The Kayoola solar bus will be officially launched by Uganda’s President, Yoweri Museveni, on February 16 at the Kampala Serena Hotel with an estimated cost of $58,000 (£40,000) after mass production and is expected to create more than 7,000 jobs either directly or indirectly by the year 2018.